You may recall from a couple of posts ago (Fornot-Me-Gets) (if your memory is better than mine), that I found that I left my paint brushes at home after traveling to see the kids down south. Upon arriving home today, the first thing I did was look for them. I could not find them anywhere. I gave up and started to unpack. My brushes were at the bottom of one of my bags. My conclusion is that I don’t actually have a bad memory, I just don’t remember that I have a good memory. 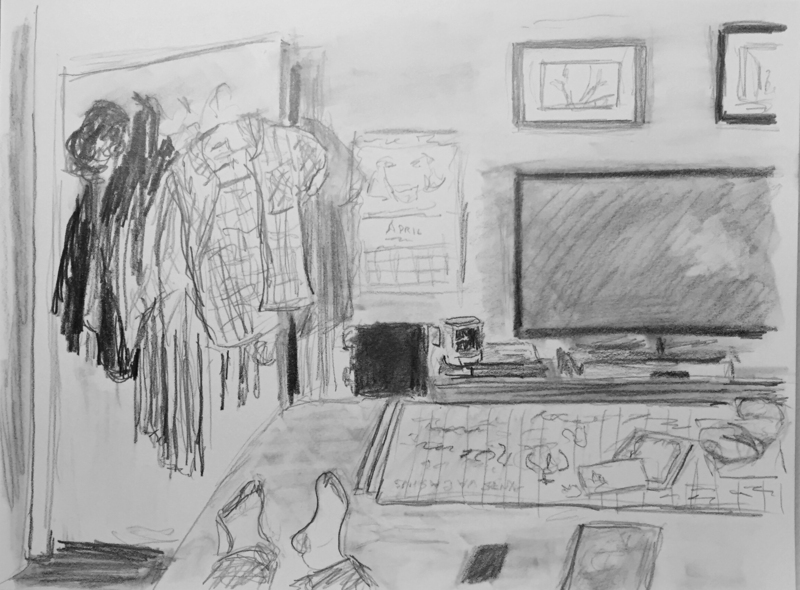 Anyway, after the exhausting trip back I drew a pencil drawing of our room as I was relaxing. This entry was posted in Personal Stories and tagged art, artistic process, creative process, creativity, pencil drawing, relaxing, sketching, tonal values, visual arts. Bookmark the permalink. “I just don’t remember I have a good memory”. And that is how we relax at home and sleep at night.